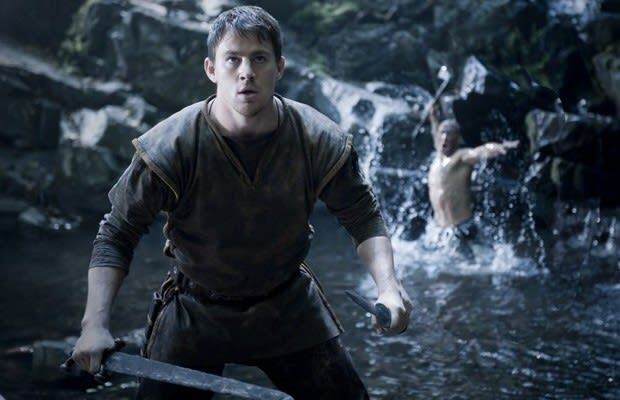 Would you follow Channing Tatum into battle? That’s the question indirectly presented in this weekend’s biggest new release The Eagle, the latest work to come from Hollywood’s neverending assembly line of Roman warrior fictionalizations. Having seen the movie, our answer is a resounding “Nah, son.” The Eagle isn’t a total loss, though; Scottish director Kevin MacDonald (State of Play) achieves an engaging and breathless pace, and co-star Jamie Bell once again shows his 25-and-under peers how quality acting is done. But the movie is predominantly a Tatum showcase, and, sadly, the former model is no Andy Whitfield (the perfectly cast lead on the first season of the Starz hit Spartacus: Blood And Sand). In The Eagle, Tatum, whose career skyrocketed after starring in 2006’s Step Up (or, as we like to call it, White Men Can Dance), mindlessly alternates between a half-assed 2nd Century Roman accent and his real-life speech, which wouldn’t ruin things if he could deliver a forceful monologue with even a shred of shot-calling command. It’s not ludicrous to think that MacDonald chose Tatum as his star simply to attract a younger female audience; if so, The Eagle was screwed before the first day of shooting. Action pics are often botched through poor casting, so we’ve relived past frustrations to compile this list of the 25 most miscast action heroes in movies.